A list of the 15-man squads to have been named for this year's Cricket World Cup in England and Wales. Legendary former Proteas all-rounder Jacques Kallis has been honoured with an Order of Ikhamanga from the Presidency. Proteas fast bowler Dale Steyn will return to South Africa after his right shoulder flared up while playing for the Royal Challengers Bangalore. The United States have sealed one-day international status for the first time with a third straight victory at the World Cricket League Division Two event in Namibia. Mitchell Starc is relishing the prospect of Australia's Cricket World Cup defence and says the event is the "pinnacle" of one-day cricket. Cricket continues to be a great brand fit for Emirates, which explains the long-standing relationship between the two entities. Cameron Bancroft hit an unbeaten 151 on his one-day debut for Durham as he started to repay the English county's faith in him. Timycen Maruma rescued Zimbabwe from a middle-order collapse and enabled the hosts to complete an ODI series clean sweep against the UAE. Fast-tracking Jofra Archer into England's provisional World Cup squad would not "be fair morally" says fellow paceman Chris Woakes. Uncapped pace bowler Abu Jayed got the nod as Bangladesh named an otherwise experienced 15-man squad for the Cricket World Cup. Cricket South Africa has congratulated former Proteas all-rounder Jacques Kallis on being honoured with the Ikhamanga Award. 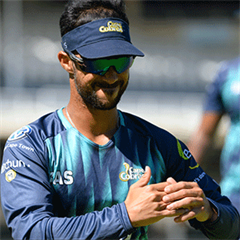 Rob Houwing has a hunch Aiden Markram will turn the corner in white-ball international cricket on the extremely fitting stage of the World Cup. The West Indies have named star players Chris Gayle and Andre Russell in their 2019 Cricket World Cup squad, but all-rounder Kieron Pollard misses out. Australia's Ashton Turner has notched up five ducks in-a-row in Twenty20 cricket entering the record books for the dubious distinction. India's cricket board on Saturday fined players Hardik Pandya and Lokesh Rahul $29,000 each for making sexist remarks on a TV chat show. West Indies have roped in former captain Ramnaresh Sarwan as a batting consultant ahead of the Cricket World Cup that gets underway in May. A century by Byron Boshoff has helped Durbanville Cricket Club (DCC) seal victory at the National Club Championships. Mohammad Nabi believes Afghanistan's spinners would be a handful for other teams at the cricket World Cup. Surprise pick Abu Jayed said his swing bowling could be just what Bangladesh needs to make an impact at the looming Cricket World Cup. Jofra Archer will have a chance to press his case for Cricket World Cup selection after being included for their warm-up matches. Bryce Parsons has been appointed as the captain of the South Africa under-19s ahead of their home tour against Pakistan. Proteas all-rounder Dwaine Pretorius will join English county club Northamptonshire for their T20 Blast in July. Current and former players of the Cape Cobras have paid tribute to former all-rounder Con de Lange who passed away last week. England have been given an injury scare before their home series with Pakistan as Jason Roy has suffered a back spasm. Aiden Markram impressed with both bat and ball as champions Hampshire defeated Middlesex in a one-day encounter. Bangladesh's Taskin Ahmed could not hide his emotions after being left out of his country's squad for the Cricket World Cup.